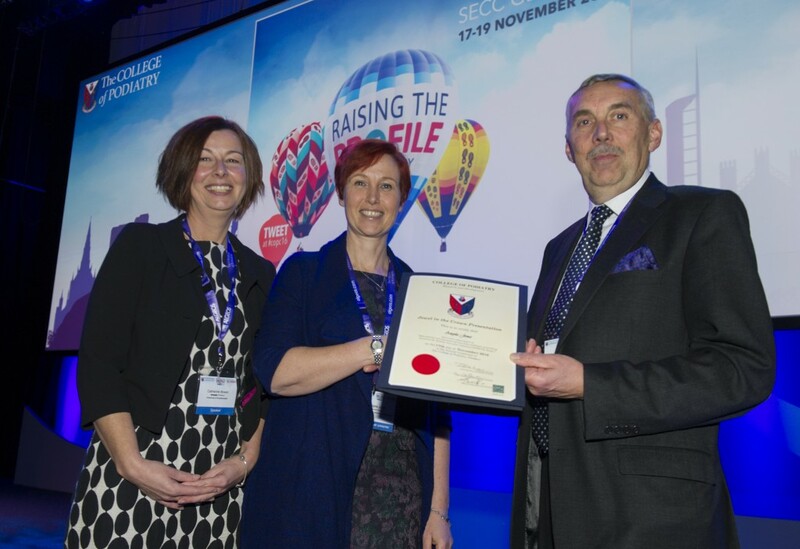 INDUCE study wins ‘Jewel in the Crown’ presentation at The College of Podiatry annual conference. This was a fantastic opportunity for a clinician to become involved in research and to be able to take the study and the results to the professional society. I was warmly welcomed by eminent world class speakers to the stage and the presentation was very well received. The experience left me with a great sense of value for the effort and achievements of all who took part in the study. The lifetime risk of developing a diabetic foot ulcer (DFU) approaches 25% in the UK, resulting in direct costs for the care of DFUs at more than £250 million. Diagnosis of DFU infection remains entirely clinical with no objective test at the point of patient care to assist the clinician in antibiotic prescribing decisions. The objective of this study is to establish the use of a point-of-care-test (POCT) to assist antibiotic prescribing decisions for diabetic foot ulcer infections. This is a pilot feasibility study which, opportunistically recruited patients from podiatry diabetic foot wound clinics. The study recruited 67 voluntary patients with diabetic foot wounds (44 non-infected, 21 mildly infected, 2 withdrawn). The study will compare clinical observations of the wound (gold standard) to the POCT results for C reactive protein (CRP), procalcitonin and calprotectin biological markers. The study objectives are threefold: To inform the feasibility of a subsequent randomised control trial, particularly in terms of trial recruitment and use of the POCTs. To determine the cut-off points for optimal negative predictive value (NPV) and positive predictive value (PPV) of a combination of the POCTs using a robust gold standard for ulcer infection. This would give proof of principle that a composite POCT can be safely used to inform the decision about infection/no infection at initial assessment in a community setting. To develop an online educational tool for DFU infection and obtain feedback regarding its effectiveness from experienced clinicians and patients. As results are yet to be analysed conclusions are pending for the first 2 objectives. The development of the online educational tool is nearing completion with favourable feedback being received from user groups. A focus group of podiatrists involved in the data collection has been instrumental in informing the feasibility of a future randomised control trial. Please visit the Centre for Trials Research website.